The current assessment of ‘Sweetheart’ sweet cherry development and freeze tolerance at MCAREC. 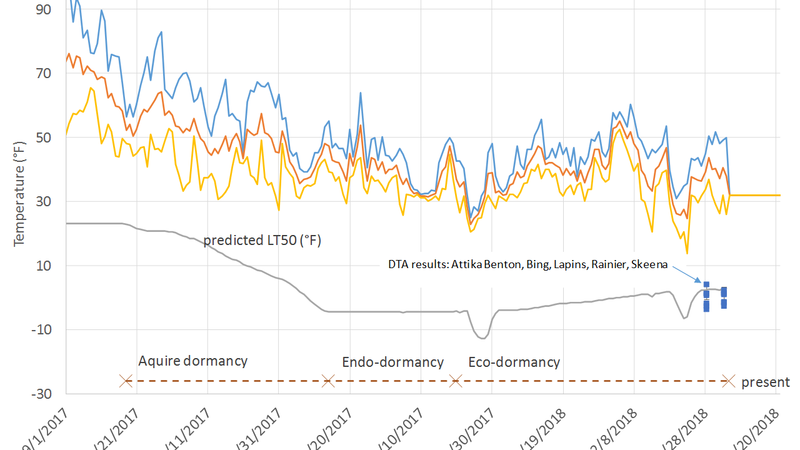 The left axis shows the ambient air temperature and the predicted lethal temperature for floral primordia (solid lines). 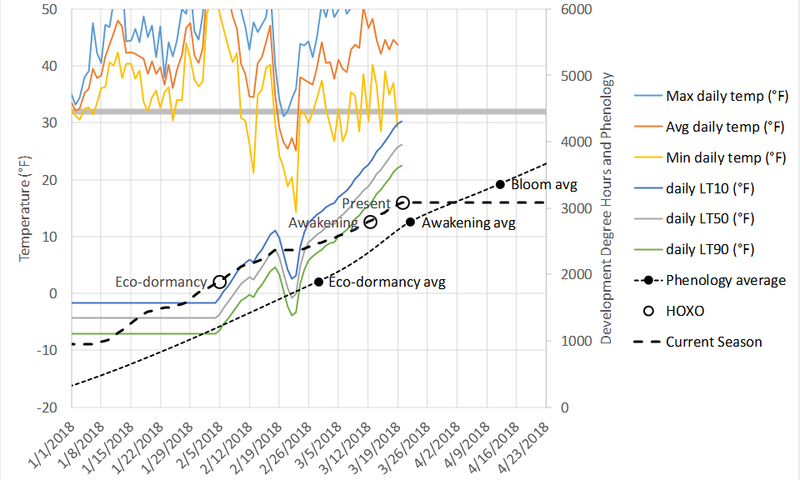 The right axis shows the hours of developmental time for the current and seasonal averages of Sweetheart at MCAREC (dotted lines). A close-up of MCAREC is shown below. Other location, station and cultivar data is being prepared. 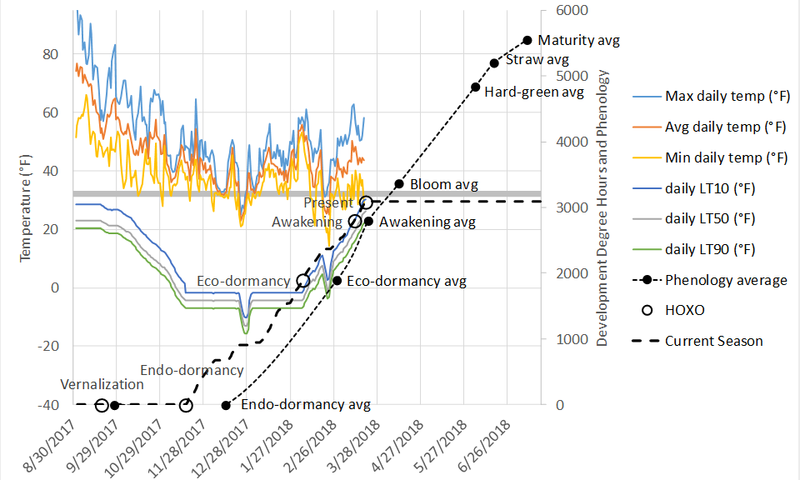 At present, sweet cherry at MCAREC is out of ecodormancy and about 2 weeks ahead in development compared to a 5-year average. These cultivars remain in early to late eco-dormancy at MCAREC. 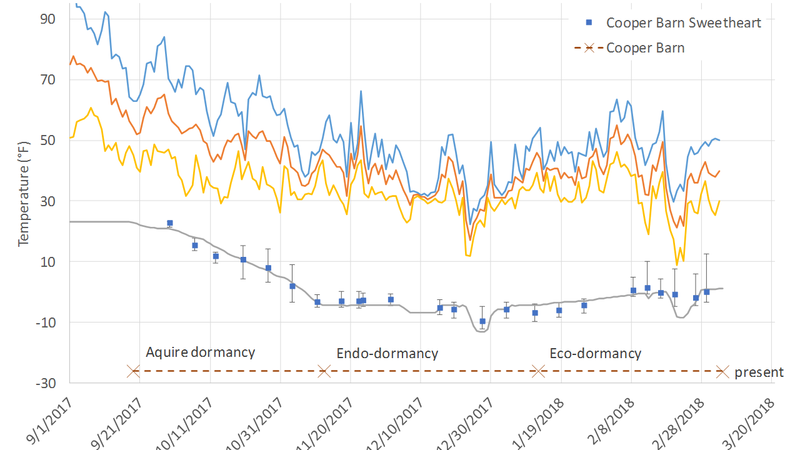 The FTEED model predicts lethal temperatures in dormant sweet cherry floral buds based on experiments using differential thermal analysis of supercooled pistils. Values for the cultivar “Regina” are 5 to 7 degrees colder than shown here for most cultivars. FTEED daily predictions begin at midnight and are based on degree hour accumulation during the previous days. Temperature data were obtained from the Columbia Gorge Fruit Growers Weather Network (weatherr.cgfg.org), Integrated Fruit Production Network, ifpnet.com (named stations), and the AgriMet Cooperative Agricultural Network, usbr.gov/pn/agrimet (all caps). This research is supported by grants from the Northwest Cherry Research Commission and Oregon Sweet Cherry Commission. 2018 Recent analysis of the freeze tolerance of Sweet Cheery floral primordia. Location, The Dalles Oregon. Method: Differential thermal analysis of 85 floral buds per date and cultivar. Table of Lethal Temperatures (deg F) determined by DTA; minimum temperatures and visual assessment of flower damage in the orchard; relative water content (RWC) and bud phenology. © 2019 Sweet Cherry Development in the Pacific Northwest, all rights reserved.